Rapid urbanisation, inequalities in income and service levels within and between communities, and population and economic decline are challenging the viability of rural communities worldwide. Achieving healthy and viable rural communities in the face of rapidly changing social, ecological and economic conditions is a declared global priority. As a result, governments all over the world, in both developed and developing countries, are now prioritizing rural and regional development through policies and programs aimed at enhancing the livelihoods of people living in rural regions. In recognition of the important roles that research can play in rural development, a range of systematic literature reviews have rightly examined key priorities in rural development including education, gender, economic development (especially agriculture), and health and nutrition (see Department for International Development [DFID], 2011). However, none of these works has systematically examined the extent to which rural development as a field of research is progressing towards facilitating sustainable change. 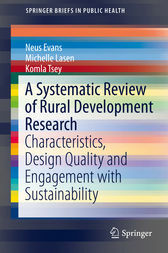 This book evaluates trends in rural development research across the five continental regions of the world. Specifically, it assesses the total publication output relating to rural development, the types of publications, their quality and impact over the last three decades. Additionally, it evaluates the continental origins of the publications as well as the extent to which such publications engage with issues of sustainability. The aim is to determine whether the rural development field is growing in a manner that reflects research and policy priorities and broader social trends such as sustainability. Development policy makers, practitioners, those teaching research methods and systematic literature reviews to undergraduate and graduate students, and researchers in general will find the book both topical and highly relevant.